So I may have lied a little bit. I know I said that I’d only post pictures of my “college style” meals, but I decided to be a little creative last night. I decided to make a recipe for Garlic Broccoli Angel Hair Pasta I found while I was searching online for new stuff to eat the other day. In reality, it probably only took about a half hour from prep to completion, but it definitely required a lot more effort than I usually put in for dinner (although that really isn’t saying much since most of my meals are made in the microwave), so I think this can still be considered a “college style” meal! As you know, my love for carbs is real, so I obviously already had a box of angel hair ready to go. And since I do love my broccoli, I had a frozen, microwavable package in the freezer, too. All I had to buy to make this was a box of vegetable stock and garlic, which cost maybe $4 together. If you want to take a look at the original recipe, click here. Simple, right? Who knew it would be so easy to make a meal that seems as if so much more effort was put in. If I could change one thing about it, I think I’d add more garlic or possibly garlic powder. Whenever I make something with “garlic” in the title, I’m expecting there to be an overwhelming garlicy taste, and I just wasn’t getting that with this recipe. But I guess that depends on the person. By the time my meal was over, the only thing I hated was how many dishes and utensils I had to clean! At the same time, I oddly love to clean, so I wasn’t too upset. I plan on having the rest of my heavenly Broccoli Garlic Angel Hair Pasta for dinner again today, so I’ll write an update on whether or not it’s good as a leftover, also. Stay tuned! UPDATE 3/18: As it turns out, this is just as good as a leftover! If not better. 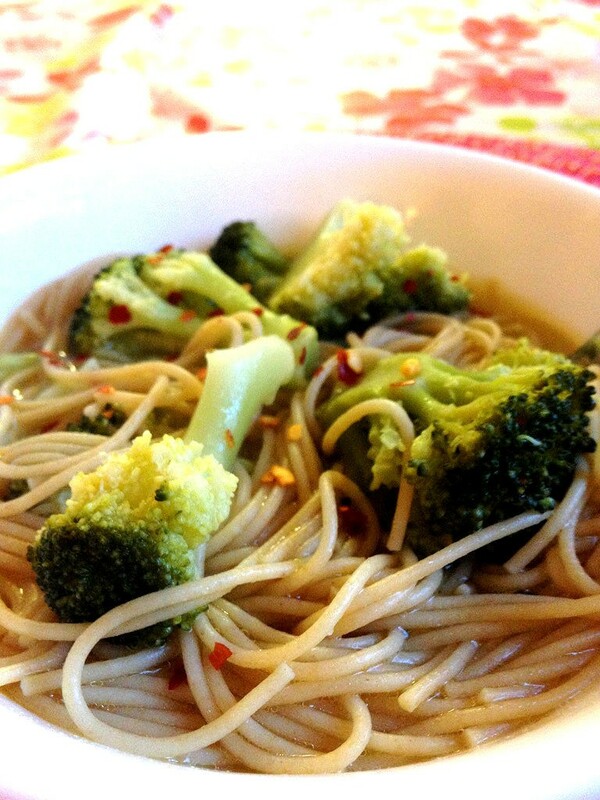 After sitting in the broth for a day or so, the broccoli absorbed much more flavor and was even better the second time. The pasta was about the same. The only thing I did was add a little extra salt and red pepper flakes because those either disintegrated or sunk to the bottom of the broth, making them impossible to taste. I didn’t add much, just enough for my palate. I only put it in the microwave for about a minute and a half (then obviously left it to cool for a couple minutes), and viola! Dinner was ready. So if you decide to make this, be sure to make enough for leftovers! Or if you want to try and be all “healthy” and stuff, you can always meal prep and have your dinners ready for the next couple of days. Either way, this is a go-to quick and easy leftover meal.